Community is very important to CrossFit Long Haul and we are always looking for new ways to get involved. We also have a passion for helping Sports Teams and Businesses in the area with a goal to create a healthier Western Australia. CrossFit Long Haul is always open to lending a hand or getting involved with local community events and fundraisers. We are often able to make donations or offer health and wellness presentations, contact us if you have ideas about how we can work together. 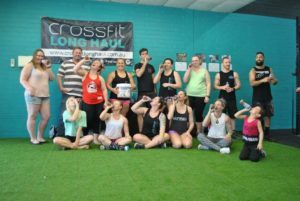 The coaches at CrossFit Long Haul in Maddington are highly experienced in providing training and nutrition programs to individuals, athletes and teams. CrossFit programming has been proven to increase strength, speed, agility, power and general fitness for a variety of sports. We can offer services such as nutrition seminars and coaching, sport specific training sessions in or outside of the gym and programming to assist team coaches. If you have a team that you would like to get in top shape for an upcoming season, contact us to find out more – we’d love to help! We know how important it is to maintain a fit and healthy team. High levels of health in employees is proven to increase productivity and morality and can bring a fresh, positive spirit to any work environment! We help businesses and employees with nutrition seminars, team challenges, group training, team building events and programming. To find out more about how we can help your business, please contact us!